Kevin Rudd has the fate of the Labor leadership in his hands, with another poll showing support for the Labor Party under Julia Gillard has slipped below 30 per cent for the first time in a year. The latest Newspoll published this morning, shows the coalition has opened up a whopping 19-point lead over Labor on the primary vote at 48 to 29. It also shows Federal Opposition Leader Tony Abbott has recorded his biggest lead over Ms Gillard as preferred prime minister at 45 to 33. 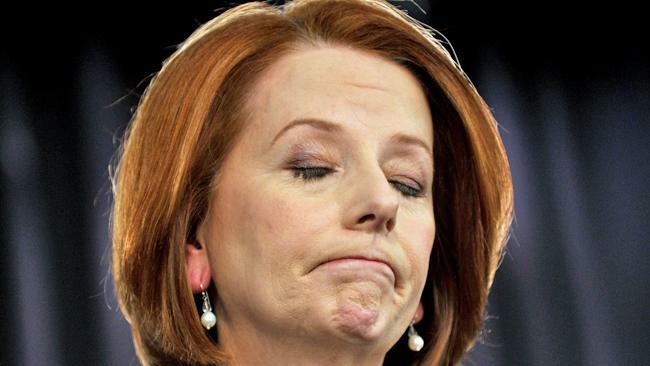 Julia Gillard’s support has fallen two points. With Parliament entering its final sitting week before the September 14 election – a period referred to as the “killing zone” – all eyes are now on Mr Rudd. Speculation is at fever pitch that he will challenge after this second bad poll. A Nielsen poll last week also put Ms Gillard’s primary vote at 29 per cent. Ms Gillard’s supporters have declared she will not quit the leadership and have dared Mr Rudd to test his numbers in a ballot. The Rudd camp thinks he would narrowly win, but this falls short of his demand to be drafted by the overwhelming majority of MPs. One supporter said it was hoped a “bandwagon effect” would convince other caucus members to put aside their personal feelings and vote for Mr Rudd. The PM’s backers made clear a leadership fight would be bloody. Senate leader Stephen Conroy said he did not believe Ms Gillard would step down. “If it’s to be brought to a head, well Kevin Rudd will have to decide to challenge,” he said. Senator Conroy said, like Peter Garrett, he would not serve on the frontbench if Mr Rudd came back. Defence Minister Stephen Smith said no one in Cabinet had the guts to ask Julie Gillard to quit. However cracks are already beginning to appear in the ranks of Gillard supporters with some suggesting a showdown this week is inevitable. As long as the unions don’t win, I don’t care anymore. Apparently lots of union friendly bill to be rushed through this week. Gillard’s is the cockroach prime ministership. It will not die. I’m sick of this whole spectacle. Labor has well and truly done itself in. There is no act of narcissistic stupidity which could come as a surprise. Now she cannot escape that curse. Her blood-soaked hand dispatched Rudd from office yet he survives as a toothy loon – smiling, crazed and driven only by revenge. Nothing else explains his actions. Both he and Gillard are acting out of unalloyed self-interest. Gillard is a desperate hollowed-out wreck of a human being. She will say anything that she thinks will help her survive and she appears to have some very strange notions as to what that may be. Her war on blue ties is not going well. Rudd is enjoying some popular acclaim. He says he is “here to help” but nothing he does really helps the party. Maybe it compensates for his humiliating dethroning. Inside he is probably more bitter and twisted than Mad Mark Latham. And so the Shakespearean tragedy plays out. The natural order of things is disturbed by the stabbing of a sitting PM. The consequences cannot be stopped and the cycle will play out until the natural order is restored at the next election. Nothing would surprise me now. I just want this nightmare over. I kind of want the nightmare over too!! But the prolonged assassination is interesting and has some entertainment value. It’s not as if Gillard doesn’t deserve exactly what she is getting. I still don’t care, but is one 457 visa holder seeking help? 12:11pm: Alastair Campbell, former director of communications to the British Prime Minister Tony Blair, will be popping into the Prime Minister’s Office later today. Just to say hi, nothing official, a spokesman for Ms Gillard has confirmed to breaking news reporter Jonathan Swan. 12:21pm: Alex Ellinghausen photographs Chloe Bryce arriving at Canberra Airport. Ms Bryce was collected by Gordon – who is usually Prime Minister Julia Gillard’s favourite driver. For once I might give Gillard some slack. i am sure she wanted to be PM but I suspect the rumours about Rudd are true. He was just impossible to work with and the govt had become disfunctional. It is clear a lot of them would rather lose their seats rather than work for Rudd. That is unusual in human beings. The Prime Minister has called for “a well-founded positive sentiment based on facts”. The Reserve Bank bases its assessments on facts. That assessment is not yet positive, even if the Prime Minister’s is. Rudd wins — we all lose! To Phoney Tony and the NO Coalition! I’m barracking for jools over the Ruddster, to make sure we get both houses in conservative hands. Must admit I find Labor voters hard to fathom. From what i have heard Rudd was a nightmare to work with. But Gillard supporters are saying that Rudd is not loyal trying to being down a sitting PM. But how did Gillard get the job?? Remaining Labor voters are not the most rational of people. More like devotees of a discredited cult. At the top of the food chain the cult leaders and other functionaries who make a living out of the cult. Then there are the life-long supporters. They may hate what has happened to the party, but can’t let go. Lastly there is an assortment of coprophages, oddballs, nut-jobs and the merely barking mad. Not sure which category Deknarf falls into. Could even be all of the above. deknarf is weird, visit his website for an understanding of his state of mind. There is no act of narcissistic stupidity which could come as a surprise. That’s a nice picture of Our Julia. It conveys the impression of a deluded queen of hearts perched on her throne strong, independent, staunchly republican woman. I think you’ll find the most vociferous of the remaining ALP supporters are welfare recipients. Particularly the ones that don’t relate to the old age pension. They seem to be threatened by Abbott. What, Shmith asked next, would Campbell tell Rudd if he were advising him? ”Do you want my honest truth?” Campbell asked. Can’t see it myself but…. Is he off to China or not ? He’ll probably phone in when a grateful party begs him to lead them. Caucus is already well and truly partitioned! Mean while, Gillard knits, and labor burns, amusing really. I mean he hardly owes them any favours does he? Kevin’s “doing her slowly” as Keating might’ve said..
After the election, he’ll be Labor’s last glimmer of hope if they want to resemble any last relic of a political force. There’s talk of a spill on Thursday @ 4.30pm and the new PM will have an election in early August… probably on the 3rd. This rumour cannot be verified. At this rate he will be the only member of caucus after the election. That would probably suit him fine. … he don’t give a FF about the country … is Kevin really here to help? Or is that just another lie? Sit Kevin in the seat and the other lot will dump Abbott for Turnbull in an eyeblink! Nah, won’t happen before the election. The people will vote on policy platform, not personalities, so the Rudd push won’t make much difference unless he dismantles every unpopular thing jools has done…. like a revolutionary. But he is human after all. The incoming government needs a mandate, otherwise it will be a double D election and nobody wants that. A centre right party in a democracy gets a landslide victory, I’m not afrayd. I disagree with egg’s view that people will vote on policy.. The Libs are a policy-vacuum but are already in a landslide election winning position. It’s too early to judge on 1, but Labor “seem” to have overspent on things they didn’t need to. So you’re hoping for Labor to be re-elected then.. I don’t blame The Kevster for twisting the knife slooooooowly. They’re all there for self aggrandisement. Name me one who is really doing it out of altruism. That’s about the only relevance this election has on my radar. The magnitude of the loss/victory…& the imbalance which it will likely confer. Not really, they have some serious infrastructure in mind. Well Talcum and Kevin certainly are. It’s not like they need the money or anything like that.. Whereas the droner from Altona is in it for the post-political career income and superannuation perks.. I can think of the tree planting thing, do you have any other “specifics”? Gillard and CU are delusional. Coincidence? I think not. 3 years ago Gillard did the air brushed glamour photos for the same rag. Now she’s got a new makeover and has embraced her inner spinster. The knitting bogan Prime Minister. Looks like its all kicking off again. Will he, won’t he, he said, she said, enemies in the camp, if nothing else it’s a novel of epic proportions for Jessica Rudd. In another complication, crossbench MP Rob Oakeshott sent out a warning of his own, telling Labor parliamentarians and the Governor-General, Quentin Bryce, that the parliamentary majority for any new Labor leader could not be assumed. Oakeshott is quitting, smart move. I’ll be very surprised if Rudd accepts the poisoned chalice of leading a deeply divided Party…at this point. Oakeshott: jumping, rather than being hurled. A tearful Mr Windsor said he had health problems and his family had urged him not to stand. The rats are all leaving the sinking ship. As I said to, The Minister, its just a pity politicians only seem to tell the bloody truth when they are LEAVING!